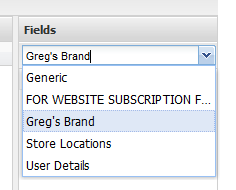 You should see on the right hand side of the screen a dropdown list with all the field groups you have created. Select form this list and drag the questions into your form. Once you have added all the fields/questions into your form you can then get the link you need to use in emails or on the website. Here you can use the Direct Link (at the bottom) to link to the survey via your website or you can add it to an email.